Ohio’s Annabel, release their third album Having It All worldwide on the 9th June. On first listen it is full of that Mid-Western American jangly indie-emo-rock that has become a staple in recent years. As the album grows on you, the different nuisances come to the fore and you realise that this is a special and complex album. Infectious and compelling you’ll find Having It All to be an album that develops and improves with every listen. Upbeat from the outset, the raucous opener of ‘Another Day, Another Vitamin’ gets the blood boiling before things explode in the fantastic ‘The Fortunate Ones’. The tight guitars wash over a stubborn drum beat with the delectable vocals of Ben Hendricks warbling just below the surface. The track builds and builds, finally exploding in its final thirty seconds in a glorious cacophony of guitars and drum beats. ‘If Only’ has a gentler undercurrent. The vocal, again is superb – gentle and almost lullabyic, coupled with the textured guitars there’s a dream like quality to the track. While the overall sound of Having It All may be awash in that Mid-Western Emo, there’s something a bit more grown up and refined about it. Annabel have honed their sound and it ends up being so compelling you just can’t get enough. The gentle ballad quality of ‘Days In Between’ tugs at your heartstrings before title track ‘Having It All’ turns things up a notch and stands out as one of the strongest tracks. It’s a little more frantic and drumming that little bit more menacing, coupled with the fervent vocal delivered by Hendricks and the big hook you’ll end up sticking this one on repeat. The groove of ‘On The Importance Of Disappointment’ is joyful and instantaneous. It’s gloriously poppy with the vocal having a Walter Shriefels quality. ‘Everything’ and ‘Ex-Introvert’ are huge tracks of the highest standard. The guitars are driving with a jangling edge; while the drumming is superb and sets the band out from the crowd as something special. Yet Annabel also excel in their quieter moments like on ‘How to: A Self Help Guide’, it’s low-fi and slow yet thrills just as much. ‘For Years and Years’ is another high point. The groove and gentle guitars help the track build towards the huge chorus that you can’t help but sing along to. Annabel save the best to last with album closer ‘Nothing Good Gets Away’. It condenses the sound and energy of the album into a brilliant five minute opus. You could lavish enough praise on this track. 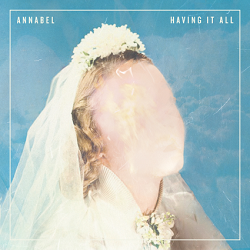 Having It All is undoubtedly the best piece of work Annabel have released. It’s American style indie-emo done to the very highest standard. Thrilling and infectious throughout, don’t let this one slip under your radar.